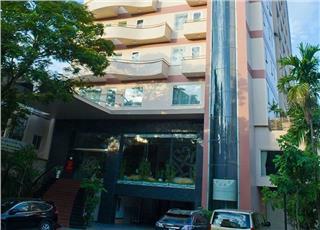 Best Western Premier Indochine Palace is located at 105A Hung Vuong Street in Hue city. Best Western Premier Indochine Palace is one of the most luxury hotels in Hue. It was launched in 2009. The hotel is situated in a lush and exotic green space of gardens. It is one of the most outstanding architectural building in Hue with international standards of excellence. 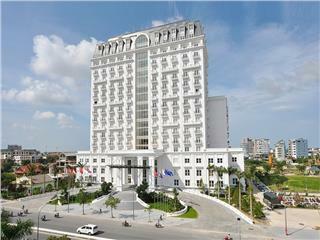 Best Western Premier Palace is situated near Truong Tien Bridge, Dong Ba Market, and Hue Royal Museum of Fine Arts. It is also near Hue Citadel and Bao Quoc Pagoda. 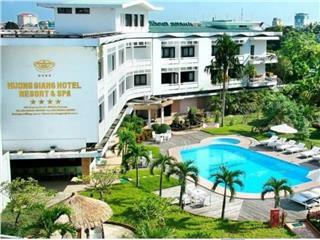 The hotel is about 20-minute driving from Phu Bai International Airport. The hotel has a design of Indochine opulence and spaciousness in the harmony with luxury and royal interior. The hotel is a perfect accommodation for well off, up-market leisure and business travelers to accommodate and organize MICEs (meetings, incentives, conferences, and exhibitions). 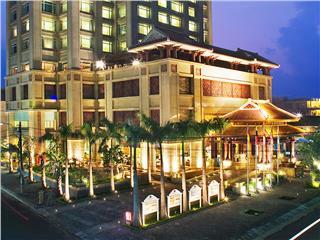 As one of the best 5 star hotels in Hue, Best Western Premier Indochine Palace possesses 222 rooms and suites. All rooms are well-appointed with space of at least 35 square meters. All 222 rooms in this hotel area categorized into three main type: Indochine Floors (from 4th to 9th floors), Indochine Club Suite (from 10th to 16th floors), and Indochine Grand Suite. Each room is highlighted by its 42-inch TV LCD and an open en-suite bathroom. The cosmetics and toiletries carry the exclusive Indochine Palace fragrance. Each room is also furnished by items with graphics on them, from the matchboxes to the in-room dining. All items reflect the attention to detail that Indochine Palace has paid to all its services and facilities. From these rooms, guests can enjoy the view of Hue City, lake, river or campus of the hotel. Best Western Premier Indochine Palace is designed and appointed to create unforgettable events and celebrations. The Le Grand Salon and 14 private meeting rooms are equipped with modern facilities and device such as state-of-the-art audio-visual equipment, large screen, live video, video-conferencing, teleconferencing and simultaneous translation services. In banquets of the hotels, guests will be served a series of elegance and style. 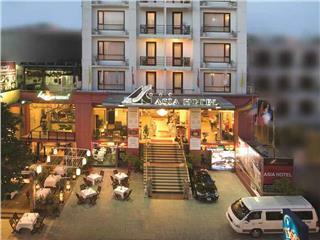 The luxury hotel in Hue has five international standard restaurants and bars. You can choose lavish meals at La Braisserie or familiar dishes at Le Petit Café. If you adore live music, you can pop in Au Rendezvous and Le Bar with a list of famous international wines. Also, you can enjoy meals or sip favorite drinks at Les Bains. While staying at this hotel, guests can improve their health by practicing at fitness center and then have some spa. The hotel also offers services of massage, steam, sauna and Jacuzzi. BW Premier Indochine Palace is a perfect choice for senior, famous person, VIP, businessmen, and travelers who love profession and luxury. As one of the best hotels in Hue, Best Western Premier Indochine Palace owns 222 rooms and suites. All rooms are well-appointed with space of at least 35 square meters. All 222 rooms in this hotel area categorized into three main type: Indochine Floors (from 4th to 9th floors), Indochine Club Suite (from 10th to 16th floors), and Indochine Grand Suite. Each room is highlighted by its 42-inch LCD TV and an open en-suite bathroom. The cosmetics and toiletries carry the exclusive Indochine Palace fragrance. Each room is also furnished by items with graphics on them, from the matchboxes to the in-room dining. All items reflect the attention to detail that Indochine Palace has paid to all its services and facilities. From these rooms, guests can enjoy the view of Hue City, lake, river or campus of the hotel. Indochine Floors (4th to 9th floors) are divided into Palace Handicap King, Palace Deluxe King, Palace Studio King, and Palace Suite King. There are 2 Palace Handicap King in this hotel. Each room has an area of 34 square meters. The room is designed to meet the needs of handicapped guests. It is outfitted with a comfortable King-size bed, large and private balcony, along with en-suite bathroom. From the room, guests can contemplate the majestic view of mountains. In the main room, it is furnished with standard amenities and equipment to support handicapped persons to make convenience when staying here. With an area of 34 square meters, Palace Deluxe King is a series of beautiful and capacious rooms (49 rooms). The room type is designed in Indochine splendor and sophisticated elegance of a Noble House. The room is outfitted with a large King-size bed or twin beds of Asian style, large private city view balcony, comfortable chairs and 42 inch LCD TV. The bedroom has a design of bright and stylish tones with wood framed light brown carpet. The room also has a working desk for you to continue your work. It is furnished with a fan and AC to adjust the climate convenient to you. The bathroom has an open concept with a designer sink vanity and two fainted glass doors. The room has a mini bar with complimentary water, tea and coffee. Palace Studio King has an area of 45 square meters with city view balcony, cozy armchair, and 42 inch LCD TV with numerous international and local channels. There are 23 rooms of this type. The Palace Studio King’s bedroom is outfitted with a large King-size bed of Asian style. Also, there is a smaller Indochine Deluxe Room furnished with a sofa close to the bed and a smaller lounge table. These rooms can be connected to an Indochine Deluxe Twin bedroom. The bathroom has an open concept with a designer sink vanity and two fainted glass doors. The room has a mini bar with complimentary water, tea and coffee. The room also has a working desk for you to continue your work. It is furnished with a fan and AC to adjust the climate convenient to you. There are 12 Palace Suite King in this hotel. Each suite has an area of 55 square meters. The suite is designed in Indochine opulence and subtle elegance of a Noble House. It is outfitted with a spacious living room, comfortable bedroom with a large King-size bed, a convenient working area. The room has a private and airy balcony for you to contemplate the magnificent view of the city. In the lounge area, there is a 42-inch LCD TV with a wide range of international and local channels, a sofa, two armchairs and a small lounge table. In the bedroom, it is the exquisite combination of Asian style on bed and spacious bathroom. The room has a mini bar with complimentary water, tea and coffee. The room also has a working desk for you to continue your work. It is furnished with a fan and AC to adjust the climate convenient to you. From the 10th to 16th floor, there are Indochine Club Suites. These suites are divided into Indochine 1 Bedroom Suite, Indochine 2 Bedroom Suite, and Indochine Grand Suite. The suite has an area of 68 square meters. All 40 suites are designed in Indochine opulence and subtle elegance of a Noble House. It is outfitted with a spacious living room, comfortable bedroom with a large King-size bed, a convenient working area. The room has a private and airy balcony for you to contemplate the magnificent view of the city. In the lounge area, there is a 42-inch LCD TV with a wide range of international and local channels, a sofa, two armchairs and a small lounge table. In the bedroom, it is the exquisite combination of Asian style on bed and spacious bathroom. The room has a mini bar with complimentary water, tea and coffee. The room also has a working desk for you to continue your work. It is furnished with a fan and AC to adjust the climate convenient to you. The suite has an area of 102 square meters. All 13 suites are designed in Indochine opulence and subtle elegance of a Noble House. It is outfitted with a spacious living room, two comfortable bedrooms with a large King-size bed, a convenient working area, and spacious balconies. The room has a private and airy balcony for you to contemplate the magnificent view of the city. In the lounge area, there is a 42-inch LCD TV with a wide range of international and local channels, a sofa, two armchairs and a small lounge table. In the bedroom, it is the exquisite combination of Asian style on bed and spacious bathroom. The room has a mini bar with complimentary water, tea and coffee. The room also has a working desk for you to continue your work. It is furnished with a fan and AC to adjust the climate convenient to you. 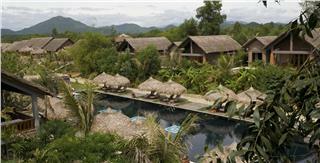 The hotel has only one Indochine Grand Suite of 202 square meters. The suite is outfitted with 1 main entrance hall, 2 separate entrance area to twin and pantry, 2 bedrooms with private balcony and bathroom each. There is a separate powder room, a living room, a study room, and a dining hall with balcony each. As being one of the most luxury hotels in Hue, Royal Halong Hotel provides you with not just luxurious amenities in rooms and suites, but also modern and professional services of bars, restaurants, conferences and events. This hotel is a great venue to hold important events, celebration and anniversaries. Best Western Premier Indochine Palace is designed and appointed to create unforgettable events and celebrations. The Le Grand Salon and 14 private meeting rooms are equipped with modern facilities and device such as state-of-the-art audio-visual equipment, large screen, live video, video-conferencing, teleconferencing and simultaneous translation services. In banquets of the hotels, guests will be served a series of elegance and style. With a desire to please guests when staying in one of Hue 5 star hotels, many exciting sports and recreation services are provided in the fitness center of BW Premier Indochine Palace. There is an outdoor swimming pool for guests with poolside bar, especially for those who love to enjoy drinks and swim together. Besides, services of fitness center, the hotel has a billiard club where guests can relax and have funny time with friends. Services of spa and massage are available to bring a sense of relaxation and comfortable after a day of shopping and sightseeing in Hue. Bhuvana Spa will offer a wide range of therapies and treatments made from nature. Guests will revitalize from the mind, body to spirit. Bhuvana Spa uses local tropical fresh fruits and vegetables selected from local market in the early morning for natural facial and body treatments. In this spa, guests can unwind with services from Bhuvana Spa packages, body treatment, scrub and facial to nail treatment, hair care and depilation. Best Western Premier Indochine Palace, one of the most outstanding Hue hotels, possesses a system of luxury bars and restaurants. These facilities are seen to be important factors to make the hotel famous. Here, in these bars and restaurants, guests will have a chance to enjoy lavish meals along with attentive services of professional staff. La Brasserie restaurant is located on the first floor. It opens from 6:30 AM to 11:00 PM. At La Brasserie, guests will be served sumptuous breakfast, lunch and dinner. The restaurant offers a wide range of Western, Asian and Vietnamese cuisines with famous dishes such as delicious pizza, Tandoori food (an Indian food specialty), Shawerma (a typical Middle East specialty) and many Asian noodle soups. While enjoying meals here, guests can contemplate the great garden and pool views. The special feature of La Brasserie is its kitchen located in the central area, surrounded by tables and seating. In addition, guests can taste many kinds of cake, pastry, bakery, and ice creams. The restaurant is also combined with a bar. This bar serves démodé espresso coffee machine and outstanding wine showcase. The bar is also the connecting area between La Brasserie and Au Rendezvous Lounge. Au Rendezvous Lounge is on the first floor in the lobby area near La Brasserie. It opens from 8:00 AM to 11:00 PM. It can occupy 60 guests, and serves many kinds of drink and snack. The lobby lounge is built and designed in classic oriental Indochine style dedicated to Queen Nam Phuong. The lounge is a cozy venue for you to enjoy great time with friends, sip favorite cocktails, teas, coffees or snacks. Le Petit Café is also situated on the first floor with the occupation of 50 guests. It opens from 8:00 AM to 10:00 PM. The café offers light meals, snacks, ice cream, fruit juice, soft drinks and café specialties with reasonable price. It also has an integrated bakery for take-away services. Le Petit Café has a design of a typical café along streets in France. Its interior is homely, a little messy but elegant. The Café appears entrepreneurial. Uniforms, menu design, table top equipment are designed accordingly. Meanwhile, Le Bar is a place for the True Connoisseur. The bar provides a wide range of international wine list, along with drinks and snacks. It opens from 6:30 AM to 11:00 PM with the capacity of 30 guests. In Au Rendezvous Lounge and Le Bar, there is live music show from 7:30 PM to 10:00 PM (Tuesday – Sunday). 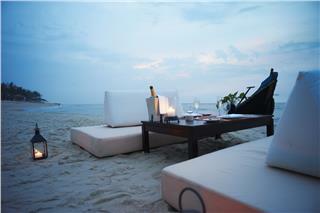 Les Bains is one of the most outstanding poolside bars of Hue luxury hotels. It serves many popular dishes, light meals and colorful array of cocktails and drinks all day. It is located on the ground floor, open from 8:00 AM to 7:00 PM with the capacity of 100 guests. Meanwhile, Le Club Indochine with an area of 112 square meters will be a wonderful place for guests to enjoy various meals and concepts of drinks, snacks, and light meals, along with admiring the magnificent city view. The lounge is located on the 17th floor with a capacity of 50 guests. If guests wish to have meals served in room, the service is available 24 hours a day. The hotel also offers Royal Dinner. During this dinner, guests will follow certain Royal Protocols, enjoy Hue Imperial Court Style Music and Dance performances. Also, guests will wear Royal costumes while having Royal cuisine. As being one of the most favorite hotels in Hue, apart from modern facilities, recreation, and service of accommodation, Hue Indochine Palace also provides other services to meet the need of guests. To vary your trip in Hue while staying in this hotel, services of providing services of airport transfer, tours, shops, and shuttle service. In addition, this hotel offers services of venues for events and celebrations. For those who love shopping but do not want to travel further, Shopping Arcade is an ideal place. The shop sells a series of Vietnamese designer wear, Vietnamese silk products, Kashmir silk products and carpet, including Vietnamese collection of paintings and handicrafts. - Accommodation of your choice. - Tea and Coffee making facilities in room. Note: This rate may be changed seasonally or due to rate exchange between VND and USD without notice. Please contact the booking staff for more information. The check-in time is at 14: 00 and at 12:00 for check-out. Yet, this timetable can be changed if you request. In case, you want to check in early or check out late, you need inform the receptionist for more support, perhaps, you might be charged a bit if check in before 2pm. An additional half day charge will be levied until 6pm and an additional one day charge will be levied after 6pm. - If you want your prices and room availability to be guaranteed, you need to deposit a full night. The balance of payment is due upon departure. You need to show your valid credit card to make reservations upon check-in for security deposit. A pre-authorization may be required. - Upon confirmation of bookings, the Hotel requires a non-refundable deposit of 50% of estimated total cost to be paid immediately. 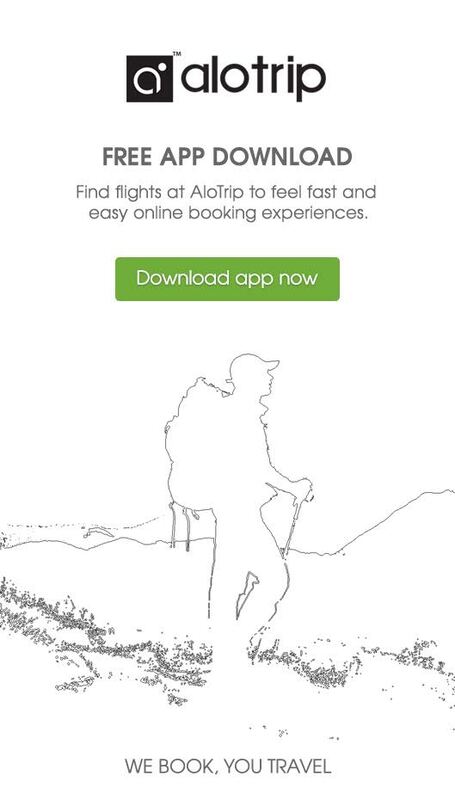 - Prior to 1600 hours (local time) on the day of arrival, you are free of charge if cancel your booking. Beyond that time the first night will be charged. 100%-rate cancellation will be charged for a no show. - Modifications to the reservation made more than three (3) days prior to arrival may be possible. - Under 6 years old will be free of charge if sharing the bed with parents and free Buffet Breakfast. - From 6 to 11 years old are complimentary if sharing the bed with parents and 50% discount off Buffet Breakfast will be charged. Upon confirmation of bookings, the Hotel requires a non-refundable deposit of 50% of estimated total cost to be paid immediately. Customers provide bank details as a guarantee of the reservation except for special conditions or rates. They will use a credit card or retail cards (Visa, MasterCard, American Express, etc. according to the selected hotel). Please contact the booking staff for more detailed information. Used to be the former French Governor’s mansion in 1920s, La Residence Hue Hotel & Spa, one of best Hue hotels, is located in the tranquil Perfume River. The hotel has 122 lavish rooms and suites with other cutting-edge amenities and facilities. Vedana Lagoon Wellness Resort & Spa has pioneered a new trend of elegantly interior and exterior decoration. From a distance, Vedana Lagoon Wellness Resort looks like very picturesque in the architecture of traditionally typical villages in Vietnam. Located in Phu Loc District, Hue City, Angsala Lang Co is away from the bustle and hustle area of the city. This 5 star resort is lying in the favorable location, which is quite easy to access to many famous sightseeing spots in and outside the city. From 98 USD/night per accommodation, Ana Mandara Hue Beach Resort provides guests with a series of international standard services. The resort has over 70 opulent villas, 2 cozy and lavish restaurants, along with a bar and lounge with wonderful sea view. 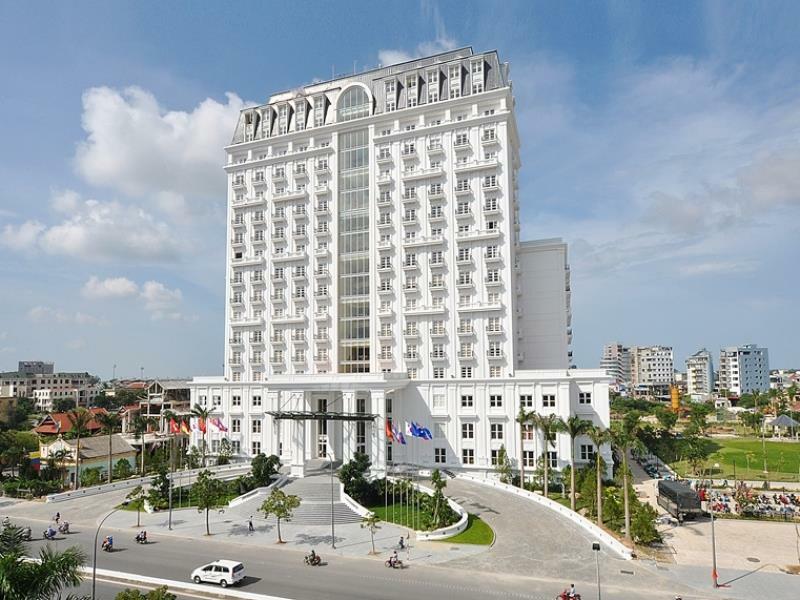 Being known as the first 5 star hotel in Hue, Imperial Hotel Hue is located on the banks of Perfume River and quite close to the world’s heritage sites of the city. Residing in the hotel, you can discover the charming of the ancient capital of Vietnam. Situated in the city center, Huong Giang Hotel Resort & Spa is a great base for travelers to relax and discover the city. With great services and modern facilities, the hotel is one of good hotels in Hue appreciated by clients. Having contemporary facilities and professional and friendly services, in 2014, Asia Hotel received Certificated of Excellence by TripAdvisor. The hotel room rates are fluctuating from USD 70 to 160 depending on room types. 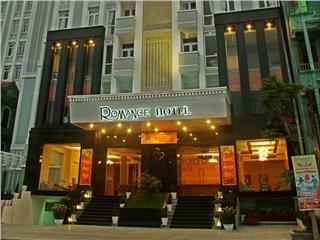 Romance Hotel is one of deluxe hotels in Hue having 113 nice guest rooms. The hotel features basic amenities and services to ensure guests the most comfortable, enjoyable and truly unforgettable time in Hue – one of World Heritage Sites in Vietnam. With a motto of “Timeless Destination, Cherish Your Passion, Culture Meets Lifestyles”, Cherish Hue Hotel has pleased many travelers visiting Hue. The room rates of Cherish Hotel fluctuates from USD 78 to 180 depending on room types. 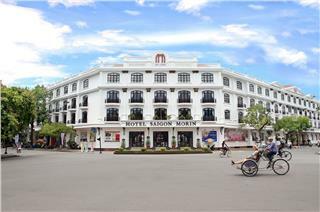 Containing eigenvalues of the Central Vietnam’s history, culture, and architecture, Hotel Saigon Morin is considered as a symbol of Hue. The hotel is one of Hue 4 star hotels being designed following classic and luxurious Indochina architecture. Pilgrimage Village Boutique Resort & Spa is a perfect choice for a serene and fresh area to escape from the hustle and bustle of city life. 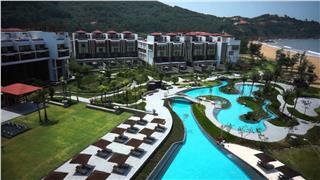 The 5 star resort has 99 elegant rooms and villas with spacious, lush, green and fresh gardens and lakes.